For many years Venom was known more as a t-shirt design than a comic book character. But then the '90s ended,and the world collectively realized that wearing black all the time, while awesome, could not go on forever. If we over-consumed the precious resource of the all-black wardrobe, its strength would diminish. And so it was decided that the responsibility of dressing solely in black would be given to Neil Gaiman alone. Time passed, the rest of the world moved on, and Marvel was left with the task of salvaging Venom and turning him into an interesting character again, a challenge they are undertaking once more in this week's Venom #1, which gets off to a good start in an unexpected way.Previously, the alien symbiote passed to a new owner, Mac Gargan, and became an amusingly horrific and unrepentant villain but the in the wake of the Siege story, Venom has been removed from Gargan and is being used as part of a shadowy weapons program by the U.S. government. 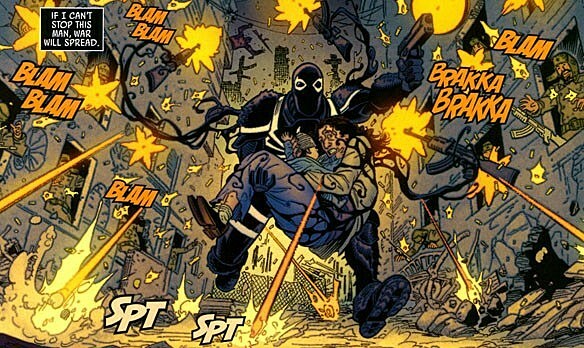 Its current host is Flash Thompson, a crippled war hero and a former high school bully to Peter Parker, who is temporarily attached to the symbiote for special, highly classified missions. 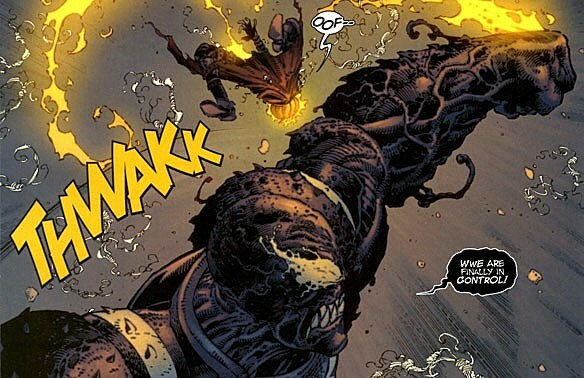 The first issue of Venom is almost entirely focused on one such mission. Thompson is sent into the war-torn Eastern European country of Nrosvekistan to capture a mad scientist arms dealer, and to bring him in alive. In his way is both a small army and the Jack O'Lantern, a mercenary supervillain sent to bring in the same scientist. 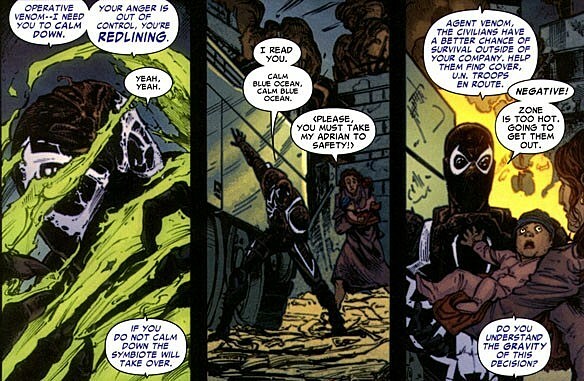 Thompson is also operating under the restrictions his handlers have placed on his use of the symbiote: He can't spend more than forty-eight hours attached to it or the bond becomes permanent, and if he ever loses himself to anger and the symbiote takes full control a killswitch will be activated and he'll die. Which is what happened to the last guy the government attached Venom to. As a military veteran, Flash has a much stronger streak of patriotism and willingness to follow orders than your standard costumed crimefighter, something we see in the inner monologue that narrates the issue. Flash has clearly held beliefs and ideals that he values above his own safety and well-being. At the same time, he demonstrates a willingness to ignore orders if they conflict with those beliefs, as seen on several occasions when he protects innocent civilians caught in the crossfire of battle rather than pursuing his assigned target. Flash wears the costume of a villain, but is clearly a good guy. And that's a message reinforced by the book's art team of penciler Tony Moore, colorist John Rauch, and inker Danny Miki's Crimelab! Studios. When Flash enters the hellish setting of smoke-clogged Nrosvekistan, he does it looking more like black-costumed Spider-Man than the monstrous Venom on the cover. And while Flash does take on a more monstrous appearance later in the issue as he loses his cool, the book still hammers home the message that this version of Venom is a good guy. Even if he's not perfect. What does strike me as odd is that I'm spending most of my time talking about the character of Flash Thompson and not the character of Venom in a book named Venom. That's because, at least in issue 1, the symbiote is treated less like a character and more like an object -- a ticking bomb trapped in the back of Flash's head that creates tension because it could go off at any moment. If previous depictions of Venom are what has you interested, you should be warned that you won't find that here, at least not in issue #1. There's about one page where Flash starts to lose it and you see the monster peeking out from inside, but that's all so far. What I find intriguing about the series is that instead of being about Venom, it's more about envisioning a darker, alternate version of Spider-Man. Like Peter, Flash's life as a hero must be kept secret from his loved ones and causes trouble in his relationships. But while Peter's left to laugh off another stood up date, Flash has his crying girlfriend slam the door in his face, leaving him to fight back against a relapse of alcoholism as he pushes himself past a bar in his wheelchair. Both Peter and Flash have been given great power and want to use it to help the innocent, but while Peter's his own man when it comes to super-heroing, Flash's powers and missions are given in the form of orders from a government official with a gruff demeanor and as yet unknown motivations. And I have to wonder if the way Flash fails in part of his mission here in issue 1 is a deliberate nod to one of the biggest failures of Peter Parker's heroic career. And it says something about the costume's original design that its popularity has led to demand for multiple incarnations of the character over its almost thirty year history. The new Venom series may not be immediately satisfying to fans of Venom as a ravenous monster, and it's a little continuity heavy for new or lapsed readers whose interest in Venom probably comes from owning a t-shirt or picking him whenever they play Marvel Vs. Capcom 2. But this is a book with good potential, and I'm curious to see whether or not Flash Thompson's going to be able to stick to his ideals and fight off the monster he's allowed inside him.